Booster Pads are made of absorbent material without a moisture-proof outer-layer. These flow-through pads are designed to fill to capacity and then allow additional fluid to pass into the host garment, economically extending the use of the primary garment and making it convenient for the end-user to change the booster pad but not the host garment. 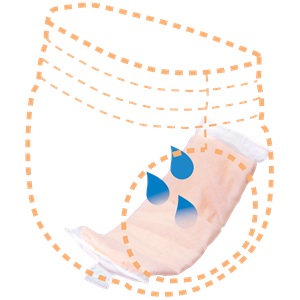 When worn inside a host garment (disposable brief or disposable underwear) booster pads can help end leaking, rashes, and nighttime changes. Thin design allows for placement in target areas where additional absorption is needed. Pad dimensions are 15" x 4.25". Super absorbency holds up to 14.2 oz. Sold by the package; 25 pads per bag.